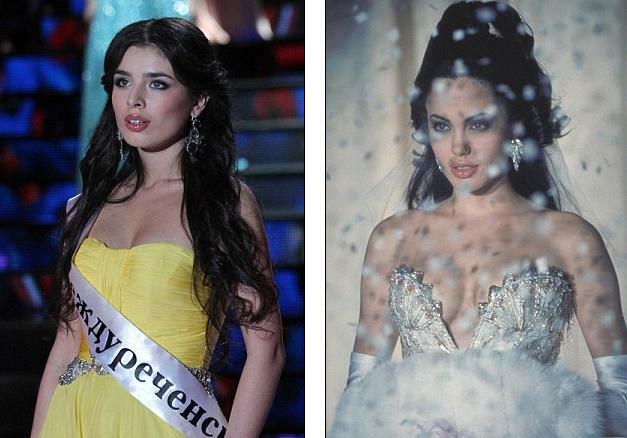 A crisis management student has just been crowned Miss Russia, much to her surprise. Siberian beauty Elmira Abdrazakova, 18, described winning the prestigious title as a rags to riches story come true, and a moment ‘from a Cinderella fairytale’. She won the contest at the Barvikha Luxury Village Concert Hall just outside Moscow on Saturday, and now the teenager will now go on to represent her country at the worldwide Miss Universe and Miss World beauty pageants. Nicknamed the Angelina Jolie of Russia, according to the Siberian Times, her resemblance to the American Hollywood actress, 37, is striking. Elmira, who studies at the Siberian Railway University in Novosibirsk, will also receive a $100,000 prize, a brand new car, and gets to wear a crown ‘valued at more than $1 million’. From a family of teachers, newspaper Komsomolskaya Pravda, she said that the key to her victory was succeeding during an intellectual contest the 15 finalists undertook. ‘I don’t have enough words to tell you what ‘s going on in my heart,’ said Elmira, 18, the new Miss Russia is from the coal mining city of Mezhdurechensk in Kemerovo region after winning. Before her triumph at the weekend Elmira had only done a few modelling shoots for shopping catalogues. But at the weekend she was given a crown to wear which cost more than $1 million, a figure which left her speechless. The eldest of two children she was raised on her own by art teacher Olga, according to The Siberian Times. She has a strong work ethic and spent most of her time studying at the Faculty of World Economy and Crisis Management in Novosibirsk. She has still not decided what she wants to do with her future – both modelling and using her studies are an option for the Siberian beauty.